cotton confetti: Christmas quilt - finished at last! 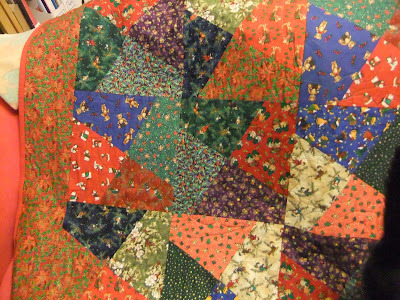 Made from Christmas fabric, which I needed to use up - the quilt was made from 4 squares of fabric, sliced into random quarters, then stitched together. The quilting is a holly leaf in each section of each square. Need a close up of that! This quilt was started a couple of years ago - the first year I pieced the top, the second year I quilted it and this Christmas I sewed on the binding.